yellow pumpkin halwa with step by step photos. gummadikaya halwa recipe has very easy process to prepare. If you are having so many guests at home then you can prepare this yellow pumpkin halwa recipe. I am preparing with yellow pumpkin and moong dal, so it is yellow pumpkin halwa. 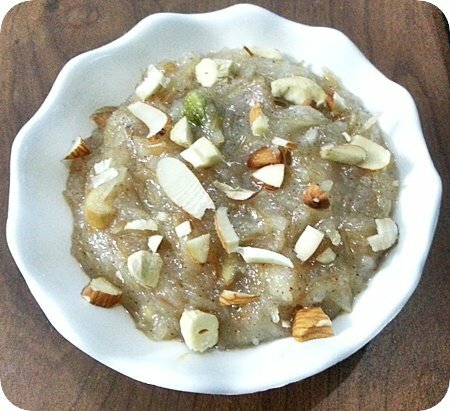 gummadikaya halwa recipe / kaddu ka halwa is one of the tastiest Indian halwa recipes. This pumpkin halwa recipe is prepared during festivals like diwali, pongal, dasara. Looking for other easy halwa recipes then check bread halwa, semolina halwa, maida / bombay halwa. Pumpkin halwa recipe has very simple process to prepare. Every one enjoys kaddu ka halwa recipe. If some one in your family doesn’t like pumpkin then add more quantity of moong dal so that they can’t recognize halwa is prepared with pumpkin. Moong dal & pumpkin are an excellent combination in halwa version. Add more dry fruits so that kids will enjoy in every bit. This pumpkin halwa recipe or kaddu ka halwa recipe is one of my holiday recipes. Use nice ripen pumpkin to prepare pumpkin halwa recipe and if you resist, freez pumpkin halwa and have it, the taste will be enhanced. pumpkin halwa recipe will suits for small parties too. The given measurements in the halwa recipe are perfectly suits for 4 people. To prepare pumpkin halwa the process is easy, just soak & pressure cook the moong dal along with milk for 4 whistles & chop the pumpkin into small pieces & grind them in a mixy jar. Then add ghee and fry the pumpkin mixture and add moong dal cook for some time. Then add sugar and dry fruits and fry for some time, that’s it delicious pumpkin halwa south indian recipe is ready to enjoy. Try other different halwa recipes. If you are looking for other sweets then check besan ladoo, rava ladoo, rice kheer, gulab jamun, chakkrapongali. Wash & soak the moong dal in milk (boiled milk) for 15 min. Now pressure cook the moong dal along with milk for 4 whistles. Peel the skin of pumpkin and remove the seeds from it. Now chop the pumpkin into small pieces. Heat a kadai add ghee and fry dry fruits until they nice golden color. Now delicious yellow pumpkin halwa is ready to enjoy. Take a mixy jar add pumpkin pieces and run the mixy once. Now add pumpkin mixture and fry for 5 min. Add moong dal along with milk and boil the mixture for 5 – 7 min (stir in between). Before switching of the stove add ghee (1 tbsp) and cook for 2 min and switch off the stove. Now delicious pumpkin halwa is ready to enjoy.